Want to see amazing Olympic-level curling live over the Internet? 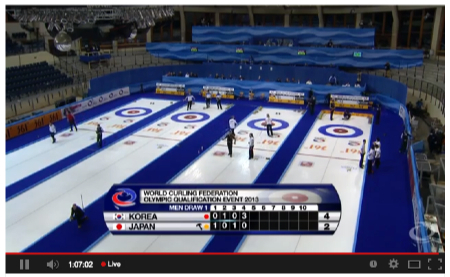 The World Curling Federation is streaming the Olympic Qualification Event live via YouTube. The schedule is online and runs from today, December 10, through Sunday, December 15, 2013. I saw part of the first Korea vs. Japan game today and it was excellent! This is the first time this “OQE” event has been run as a way to identify the last two teams that will compete in the 2014 Sochi Olympics. Essentially, there are already 8 curling teams qualified for the Sochi Olympics and this event is a chance for everyone who hasn’t already qualified to potentially earn one of the last two spots. The USA already qualified for the Women’s event but the USA Men’s curling team is in this event vying for one of the two men’s teams. Note that the times on the schedule of games are in Central European Time, which is currently 6 hours ahead of US Eastern time. Tune in to watch some excellent curling! And then… if you’d like to see the sport of curling brought to southwestern NH, help us get the word out and let us know you are interested! This entry was posted in News and tagged Olympics, WCF on December 10, 2013 by Dan York. 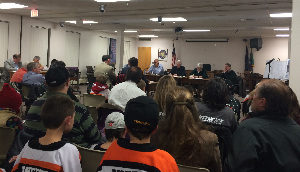 Congrats To Keene Ice On The Unanimous Keene City Council Vote! CONGRATULATIONS to the team at Keene Ice for the unanimous vote of the Keene City Council to proceed with executing the development and operations agreements between the City of Keene and the Keene Ice organization! 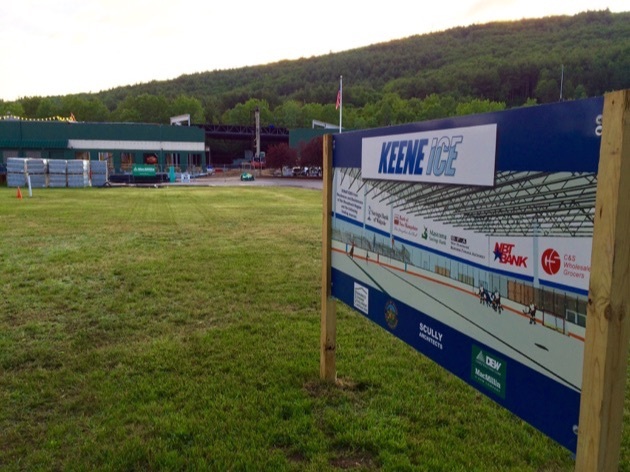 This is a huge step forward and means that if the fund-raising all works out we should see a brand new ice arena here in Keene opening as soon as next September – awesome news for those of us who love winter sports! Curling is a sport that is accessible to all ages… young, old, and everywhere in between. And while you obviously may play better if you are in athletic condition, you certainly don’t need to be. I’ve played on teams with people of all ages and physical conditions. If you can’t bend your knees you can deliver rocks with a special stick. There are even leagues of wheelchair curlers. Pretty much anyone can play curling! 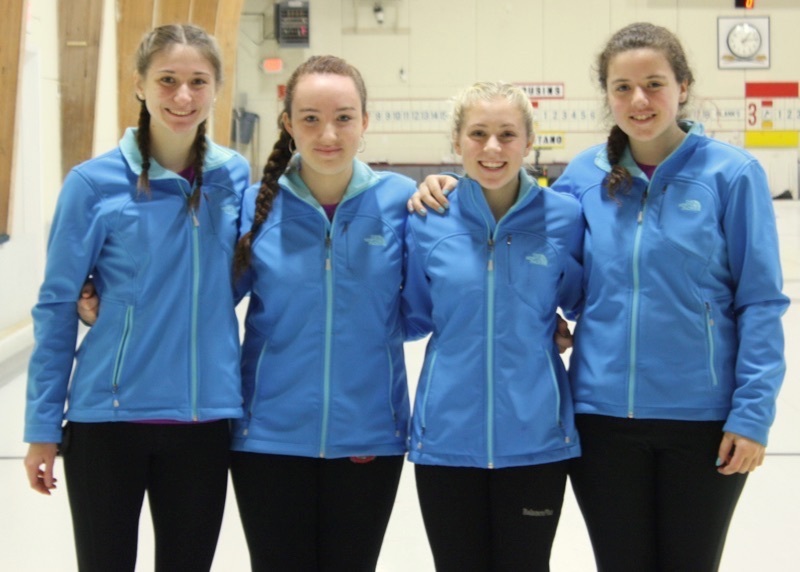 That’s why we want to bring a dedicated curling facility to the Keene region – to provide another winter sport option and to make Keene a true center for winter sports activity! 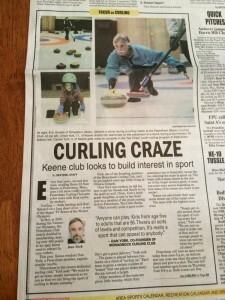 WILL YOU JOIN WITH US and help us spread the word about bringing curling to the Monadnock region? P.S. And yes, we are talking to the Keene Ice folks because there does appear to be a place in their plans where they might be able to add a couple of sheets of curling ice! Stay tuned…….. 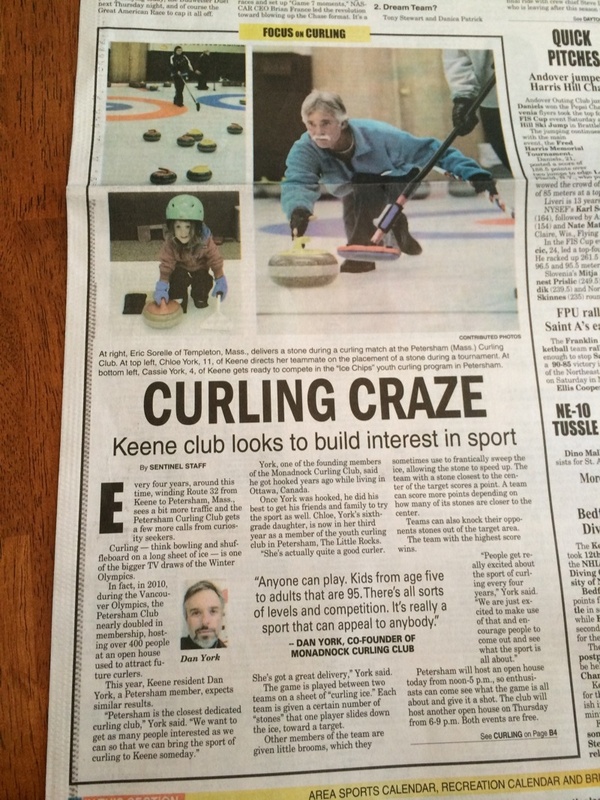 This entry was posted in News and tagged Keene Ice on November 26, 2013 by Dan York. If you get a chance to go to the Keene City Council meeting tonight, Thursday, November 14, 2013, the proposal for a year-round skating rink from Keene Ice will be under discussion. While we’ve written in our frequently-asked questions why we are seeking a dedicated ice facility, we’re very much in favor of seeing Keene Ice’s proposal go through. The Monadnock region needs more access to winter sports facilities – and it would be outstanding to have a year-round skating rink here in Keene! I (Dan York) am planning to be there and I hope others will join in the meeting as well. This entry was posted in News on November 14, 2013 by Dan York.